Dystopian Detroit. Criminal exploits. No name thugs. Guns and drugs. These are probably words, phrases, and tags seen before in other movies, and apt descriptors of Brick Mansions. The movie is a remake of 2004’s french title District B13 and stars the late Paul Walker as police officer Damien Collier. For about a year, Damien has been undercover looking to take down Tremaine (RZA), a kingpin who also killed Damien’s father while he was in the line of duty. Tremaine is the most dangerous of Detroit’s criminal underworld, and this underworld is housed in Brick Mansions, a place so dangerous they built a wall around it to protect the rest of the city. 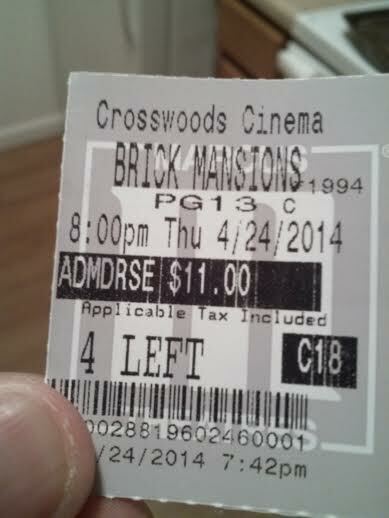 Brick Mansions, once a place of great prosperity, is now a hellhole no man or woman should venture into. To take down Tremaine though, Damien will have to do just that. But he is going to need help, Lino Dupree is an in and out con who isn’t really a bad guy, but more of a victim of circumstance. As a resident, he knows Brick Mansions like the back of his hand. For Lino, it becomes personal when his girlfriend is taken hostage by Tremaine. What is worse is the rocket bomb located somewhere in the projects, which will demolish Detroit in 10 hours if not stopped. To save Detroit and exact revenge, the reluctant duo must come together for a common cause. Brick Mansions is not going to blow anyone away, which should not be appalling looking at the trailers. It really does possess a straight to home media vibe, from the cast to the direction. But you know what? I did not think it was completely terrible and dare I say I was still kind of entertained, all because I knew what I was getting into. In no way does this absolve the film’s problems, and it was not worth 11 dollars, but I have felt much worse spending my hard earned cash on other cinema films. Let’s get right down to the acting, specifically Paul Walker’s in his last full role. It is not controversial to call Mr. Walker an average actor, and many of the roles and movies he starred in were never that acclaimed. He knew his limitations, and there is no fault in that. One thing he often had in most roles though was screen presence and silent charisma, which is evident here. 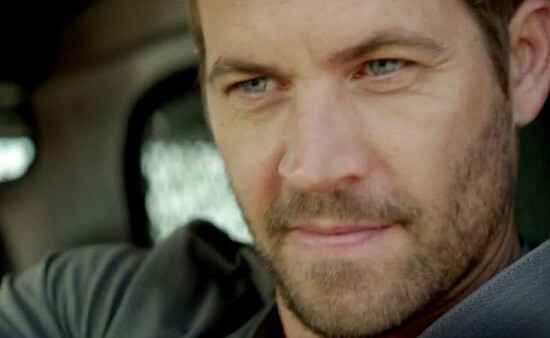 It may sound politically correct, but he really is the best thing about Brick Mansions. Likable, endearing, and just a good guy to pull for. As for the rest of the acting, it is downright abysmal. Maybe a quarter of this is due to the dreadful dialogue, which falls into the typical hard sounding thug talk that is supposed to be realistic and fear-invoking, but comes off as dated and hilarious. 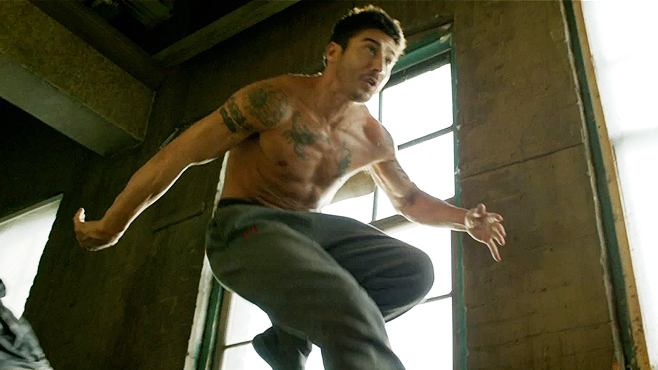 David Belle, one of the founders of Parkour, brings amazing physical feats to the silver screen, but his acting chops are nonexistent. To add insult to injury, he clearly struggles with the English language which ends up resulting in horribly dubbed dialogue. Still, he is not the worst actor in this movie. That title indisputably belongs to RZA. His Tremaine is supposed to be menacing and unflinching, but time and time again he brings the same facial expression to the character, and the dialogue delivered by him may be the worst heard all year. He has no thespian talent, plain and simple, and it is time that Hollywood stop giving this man so many chances. 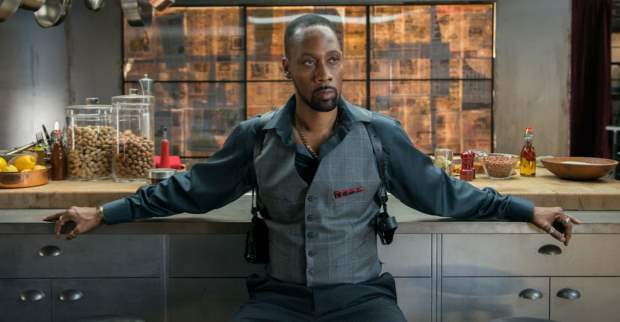 Honestly, there are worse actors present, especially RZA’s main henchman who is just as offensive, but none have the billing that RZA does in this. The plot itself is nothing to write home about, and is somewhat absurd and slightly predictable. Just take it for what it is. There are times late when the movie makes thinly veiled allusions to present day Detroit and the Occupy Wall Street movement, but it basically is a popcorn movie existing to showcase guns, stunts, and fisticuffs. The only big issue had is that everything wraps up too nicely given that the movie was a full on war moments before. As a whole, it is nothing that hasn’t been done or seen previously (and better at that), but at least it only last 90 minutes. There really are some well done set pieces from time to time. Parkour may be a passing fad now, but when done right, it is still a treat to witness, and David Belle moves effortlessly between chasms and rooftops seamlessly. Paul Walker provides more hand to hand and firearm combat, and he looks right at home in this element. Problem is, director Camille Delamarre (Taken 2, Transporter 3, Columbiana) uses terrible framing and janky editing during a lot of these scenes. It is quite sad, as Belle and Walker are clearly doing some good things. For some asinine reason though, this man insists that wobbly framing, needless zooms and archaic Matrix-like slow motion is needed. Not all looked bad, but a more consistent steady hand could have worked wonders. Brick Mansions is unimpressive, but crazy to say, also enjoyable. Heavily flawed, but entertaining (in a bad way half of the time) and fast paced enough to check out through rental or Netflix. Non action fans should avoid at all costs. With tempered expectations though, Walker fans and action fans may find enough here for mild satisfaction. A perfect film to throw on in the background and not think too much. Photo credits go to acesshowbizz.com, craveonline.com, and amctheaters.com. Yeah, this one was a pretty dumb movie. But at least it knew it was and decided to just roll with the punches while it could. Good review Jackson. Exactly sir. Not everything has to be A or even B grade stuff. Bad? Yes. But I’ve viewed much worse and had less fun with “better” made films. It is what it is. I haven’t seen this. And though you say it is enjoyable, I find your review doesn’t really make me want to change that. Great work! Thank you. And I do not blame you. While I was still able to find fun with it, this is a bad film. But entertaining to some people like myself for some reasons! Makes 2 Guns or Olympus has fallen look like pure gold in comparison! I have yet to see those other two movies, maybe soon. Without a doubt, this movie is bad. But I thoroughly had fun with it despite it’s many shortcomings. My expectations were very grounded though. I think this really falls into two categories: People who know it is bad but had fun with it (myself) and people who know it is bad and consider it one of the worst of 2014. I see both views. Yeah, I knew it would be bad but it exceeded those expectations of being bad haha. Maybe it was that I was in the middle of an argument with my girlfriend while it was on (Drive-in)….maybe it was the completely stupid twist considering how poorly the characters were developed….or maybe it was the fact that The Raid 1 & 2 make a poorly made action flick like this look like poop…. …But yeah, bad experience. I am currently writing a review of it and trying to be as fair as possible haha. It just became so bad it was funny and sort of entertaining. Eagerly awaiting your take sir..
Can not understand why Hollywood “remakes “foreign” movies. The main problem is they see a great movie in another language and say “that is great we should just remake it in America” But they then set about changing the storyline, the mood of the movie, the personality of the lead actor, throw in a few car crashes and then cant understand why it is not as good as the original. I must say I have not seen the original, but I know it will be massively better than this. I don’t think anyone will truly defend this as a good movie, but I’ll admit I had fun with this. Dumb fun, but fun.